The Blood-Horse magazine has started a series of features on old horses, which is a great idea. so I thought I would join in and write about a remarkable horse, one who exemplifies the true essence of the Thoroughbred. The racing world got to know trainer Tim Ritchey when he stormed on the scene in 2004 and 2005 with the tough, brilliant, and courageous Afleet Alex, who, even before his Triple Crown escapades, became known for his two-a-day training, going out for an early jog, then going out again at about 8:30 for his gallop or work. Ritchey knew about toughness in horses from his days riding hunters and jumpers in three-day events and dressage. He was even sponsored for the United Stakes Equestrian Team and was on the short list for the Olympics, but lost all chance of making the team when his horse was sold. 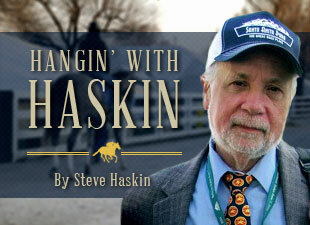 He began riding steeplechase races in Maryland before turning his attention to Thoroughbreds. Although Afleet Alex was Ritchey’s shining moment in the sport, his first great training job came 13 years earlier with an old warrior named Sir Prize Birthday, who he had trained twice before in the horse’s career. Sir Prize Birthday, in his own way, is one of the most remarkable horses to have raced in this country in modern times. We are currently immersed in the Kentucky Derby trail, where the spirit of the Thoroughbred shines each year. But that same spirit exhibited throughout the year by less-talented horses often goes unnoticed. To these horses, the chance for fame and glory has long passed them by. They have become obscure figures hidden behind a veil of cracked bones, bowed tendons, nagging injuries, and old age. Thankfully, more and more are stepping up their efforts to find these horses a home after they retire. One such horse was Sir Prize Birthday, who competed to the age of 12, making an astounding 206 starts, running at 20 different racetracks, being ridden by 52 different jockeys, and changing trainers an unbelievable 29 times. When Ritchey took over his training for the third time, Sir Prize Birthday was in poor health and got sick shortly after arriving. He also had other problems, so Ritchey sent him to New Bolton Medical Center, where his problems were cleared up. Ritchey changed training tactics and went back to basics. What was amazing was, despite all his problems and his old age, Sir Prize Birthday never lost his enthusiasm for racing. He loved to train, he loved to compete, and was always hollering for his food. And he loved all the attention. Ritchey said at the time that as long as he was healthy they would continue to run him, but they would never abuse him or force him to be a racehorse. Sir Prize Birthday finally ran his last race on March 16, 1992 at Penn National, where Ritchey was stabled. What was truly remarkable was that in his final 25 starts, at age 11 and 12, he finished in the money in 23 of them, with six wins, nine seconds, and eight thirds. In his only two out-of-the-money performances he finished fourth and fifth. What a career he left behind. After being claimed four times between Feb. 22 and Sept 3 of 1987, Sir Prize Birthday, a son of Singh – Prize du Nord, by Vent du Nord, wound up with trainer King Leatherbury, where he became the object of one of those notorious Maryland claiming wars. Leatherbury claimed him from Tony Tropia in Jan. 1988, then lost him to Ron Alfano in July of that year. Later that month, Paul McLelland claimed him from Alfano. On Sept, 10, Michael Tromboletta took him from McLelland.. Ten days later, Sir Prize Birthday was back in Alfano’s barn. On Dec. 22, Ellis Pruce claimed him from Alfano, but six weeks later lost him to Ritchey. Ritchey’s first encounter with Sir Prize Birthday was short and sweet. After only a month he was claimed by Bill Boniface – eight claims in 14 months, all in Maryland. After that, the barn hopping continued with Sir Prize Birthday finding himself in the barns of John Lenzini, Jesse Murray, Rhea Pennella, Ritchey again, Larry Reed, and finally back to Ritchey, who claimed him in Dec., 1990, just before his 11th birthday, even though the old horse was winding down, winning only one of his 20 starts that year and finishing out of the money 13 times. Then came the amazing resurrection, as Sir Prize Birthday won six races and finished in the money in 18 of his 21 starts the following year at age 11. Ritchey remembered him from when he was riding show horses in Maryland and would see his name in the entries and would watch him run. He recalled that he was “big and strong and was made to be a racehorse.” When he trained him, the only way his owner knew who he was because the point of one of his ears curled right around under itself. When Sir Prize Birthday finally was retired, while still sound, he had made five starts at age 12, finishing in the money in every one of them. The year before, Ritchey had begun thinking about getting Sir Prize Birthday into the Thoroughbred Retirement Foundation’s program at the correctional facility in Wallkill, N.Y., where he would work with the inmates as part of the Second Chances Program to help rehabilitate them. This was the extreme infancy of retirement programs and it was the TRF that paved the way. Ritchey felt he deserved a happy and useful life. He made several inquiries and, although it took several years, he finally got him in the program. Sir Prize Birthday arrived at the Wallkill facility on Aug. 1, 1998, and ruled the herd for the next 17 years. Right up to his death, Sir Prize Birthday was still fiery in nature and taught even the most tenacious horses in the herd how to behave. Over the years, he worked with approximately 30 inmates, turning hardened criminals into respectable individuals who could fit into society. Yes, this was a true Thoroughbred.